Last Saturday (8/18) brought the car out to run at a little test 'n tune. Since Farmington, I'd changed out the alternator and voltage regulator, as the car was discharging and heating up the alternator when off. Also did some leaf spring tweaks I'll talk about later. Had it on new shaved 265/35-18 Dunlop Direzza Z2's on some new wheels, also had a new set of shaved Hankook RS3's on the Jongbloeds, with the idea being to scrub both sets in and do a little compare/contrast. Up to that point had been running a 265/40-18 rear tire, about 1 inch taller. The course was pretty fast, and on the second lap, something "happened" just after a particularly fast/high-revving section. Felt like the engine was on 7 cylinders. The car had been cutting out at strange times, so I was hoping the problem was electrical. That's the intake rocker on cylinder 6. Totally kafluie, bummer. Could tell as soon as I pulled the valve cover, it was sitting in there sideways. Am thankful it was an intake and not an exhaust rocker, as I hear bad things can happen to the carburetor when the exhaust valves don't open. 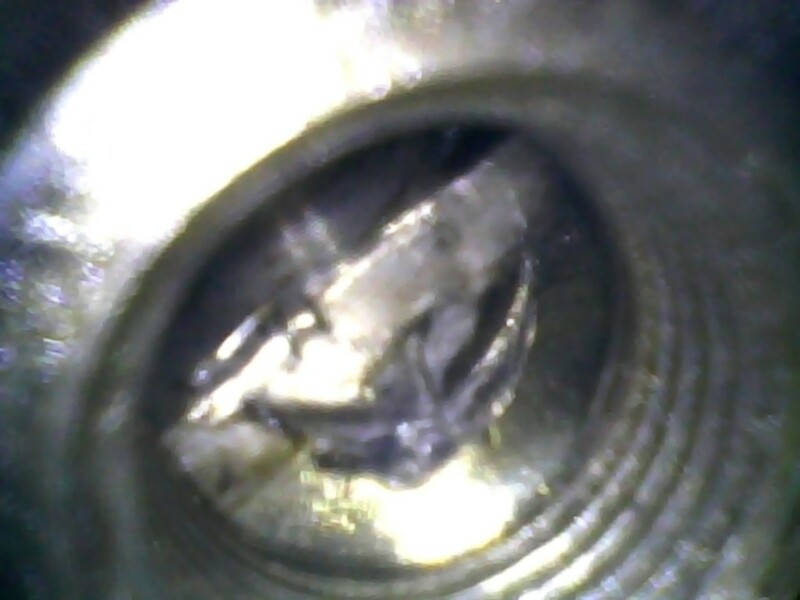 Upon further inspection the neighboring areas looked ok; the pushrod was ok, as was the top of the valve. In the rocker's destruction it didn't send big shrapnel everywhere, and on a gram scale, its weight is in line with a brand new rocker. Of course, I couldn't determine this until getting some new rockers. New rocker arms, for an engine built in 1967, that are legal for ST. In a week. 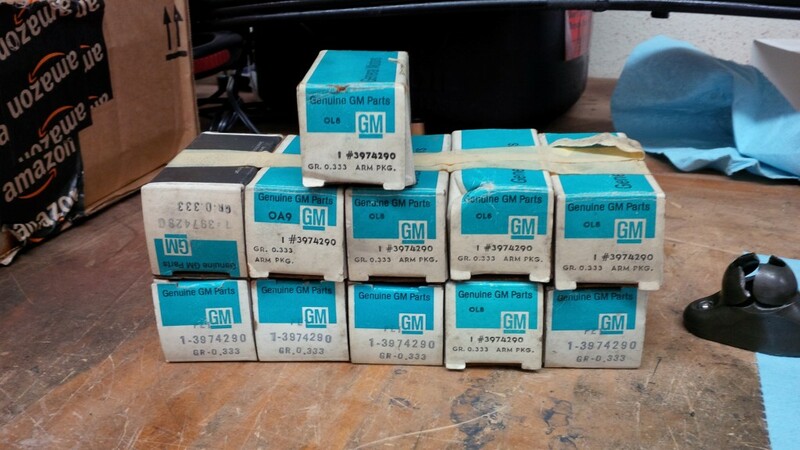 The above picture is one batch - a set of 11 NOS rockers with a part number that supercedes (http://www.gmpartswiki.com/getpage?pageid=85941) what was originally put on the cars. The look, feel, and smell of the boxes brought me back to a time...technically before I was born, I suppose! A real treat. The other batch was for a complete set of 16 used factory "o" rocker arms - a long story. 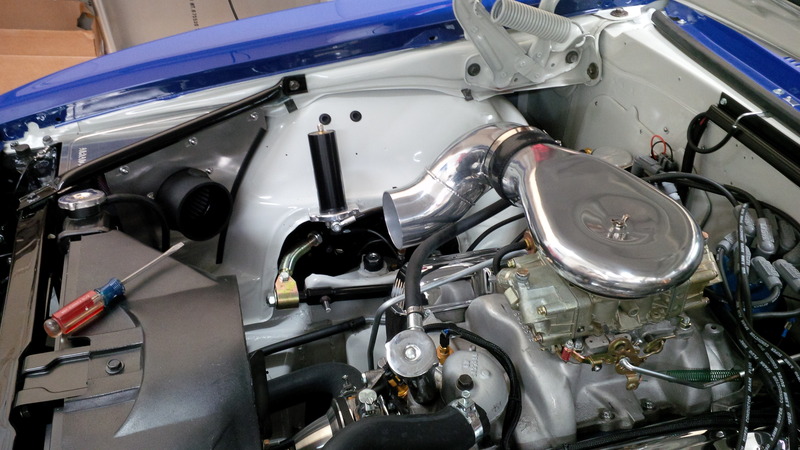 Wasn't comfortable in the health of any of the rockers on the car, so all got changed - all exhausts are new, and 5 intakes got used "o" rockers. The #6 exhaust rocker was showing signs it was on its way to suffering a similar failure, glad I changed them all out. To keep this from happening again, will be lowering the rev limiter on the car to 6900 or 7000. This will take away a few mph on the top end, which is already being further reduced by the shorter rear tire I've moved to. Because of this I will likely switch to 4.56 gears next year from the current 4.88. As it is with the /35 out back, the car should be good for about 65mph in second, which is good enough for most Nationals courses. If it runs that is, will find out tomorrow. Did a totally boneheaded move while diagnosing/examining things - threaded in the compression tester too far while testing the first cylinder (#2). Far enough, the piston hit the tester when I turned the key...was able to get the tester back out, but it boogered up the spark plug threads a little in the process. So in addition to the rocker arms, ordered a tap kit for spark plug threads, and an digital endoscope for examining the cylinders. Figured I could use it to look inside cylinder #6 also, where the rocker failed, to ensure it wasn't caused by any sort of piston-valve contact. Going to try running it like this, though I know sharp edges can cause all kinds of problems. If it's no good, I won't be making the haul to Nebraska. Full oil/filter change, along with a 6 quart "clean oil flush" to try to get out anything bad that might have been in the pan, without pulling the pan. Have some minor exterior/appearance changes that I think really work, people can see them in Nebraska assuming I make it. Put in a cold air intake - I'd noticed at Farmington, the car was unhappy for Saturday morning runs when it was hottest out. While more power isn't really what the car needs, this should at least make it more consistent. 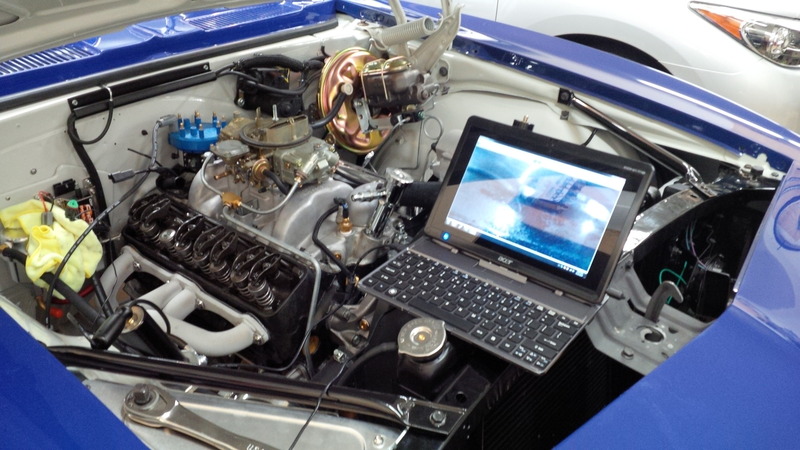 I also plan to have it help with splashing-fuel management which I'll explain later. After Farmington I'd noticed some rubbing in the left rear - the wheel had traveled to places in relationship to the body, it shouldn't have been able to. As it was, the left side of the axle was sitting about 1/2" further forward in relation to the springs, than it should have been. I deduced this was due to the spacer blocks I'd been using - they have a little post that comes out the top, to keep them aligned with the upper portion of the leaf spring pad. As supplied, the post was too long, and I had to cut them down to fit up against the axle. That was fine at first, but I later decided to add an additional spacer that adjusted pinion angle downwards; the thing consumed the post height, leaving no post from the main (1.5") spacer block to engage directly with the axle. Well that's no good! So, new spacer blocks ordered and installed, with full height posts, to keep engaged to axle even with pinion angle adjuster. All of this leads to my latest thinking on leaf springs - that they're really not that bad. 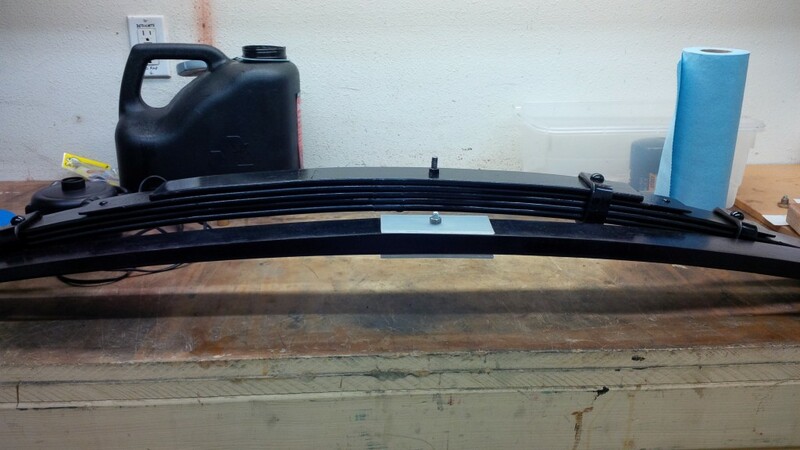 The problem is nobody makes the right leaf springs so everything ends up a bad compromise. You don't want to have to run a spacer block - they separate the parts that are there to help control the axle (the springs, and in my case, the driver-side watts mount) from the thing they are trying to control. This increases the leverage things like hard acceleration and big lateral forces have on the components. 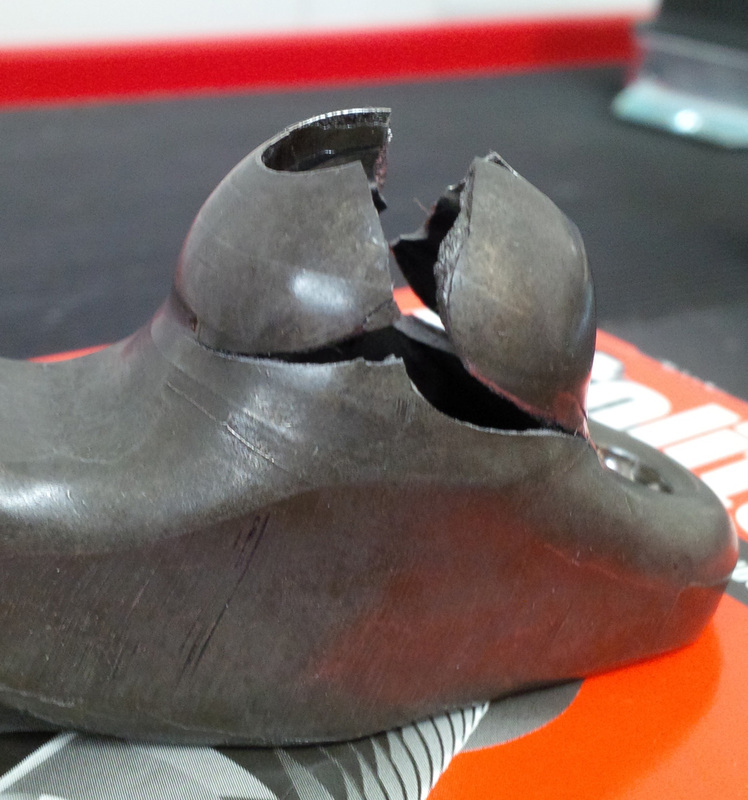 But to have no spacer block, you have to have a spring that has the right resulting shape/height at your ride height. In the world of coil springs this is a piece of cake, because there is big selection on spring rates and free lengths, then you can almost always change your perch heights. With those things, you can account for a lot of variation in sprung weight, desired ride height, and desired spring rate, to get just what you want. With some quick strings and eyeballs I determined I need a leaf that is roughly flat with the car at ride height. How to get there? The first choice to make in leafs is steel or composite. Steel has been around forever and it's fairly commonly known how to get the rate you want. The problem is they are heavy, ridiculously heavy! In the above photo, the composite leaf weighs less than 10 pounds, the steel weighs over 50! Guess which one is stiffer? You'd be right if you guess the composite. The problem with composite springs is they aren't designed to go over-center, or flat. There are varying levels of cloth set in there in different directions, and everything goes backwards when the spring goes from a "U" shape to an "n"shape (or from a smile to a frown, when seen from the side). Steel should be able to do it, if the springs are designed for it. The steels pictured are the lowest ones Global West sells, which they say lower the car 2" from stock. Whose car? Those sorts of statements bake in an assumption about what the car weighs - and my car is quite a bit lighter than most, especially in the back. The steel springs have 1" more "free arch" than the composite pictured, which is already 1.5" too much free arch. Can maybe have the Global West springs de-arched (a trait unique to steel) but it will take time, won't be able to do it until after Nats.